By the standards of its day, the Cadillac Eldorado Brougham looked subdued! 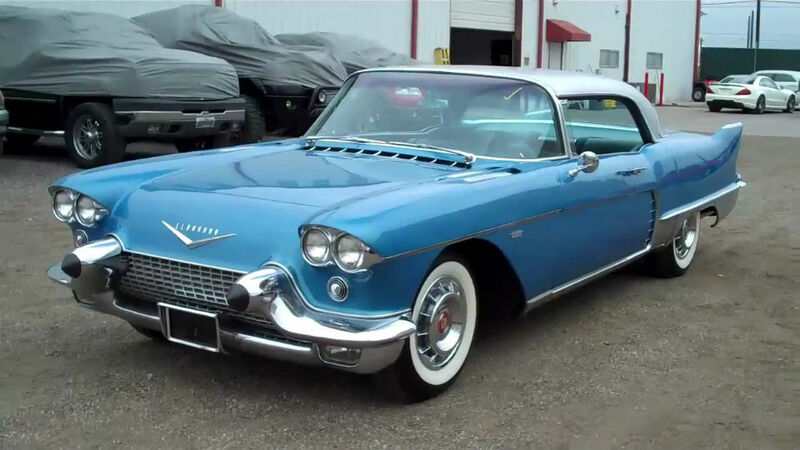 Next to its sibling, the Eldorado Biarritz, say, the tail fins on the Brougham were positively petite! Such delicate sensibilities were to be found on other parts of the car, too. The aluminium pillar-less roof was a 'shining' example. And the narrow, whitewall tyres were a deft design flourish. This was the first car to feature twin headlights. So, the Brougham had a refinement sadly lacking in some of its peers. It was based on a 'dream car' - which had appeared at 1954's Motorama. The 'Park Avenue' prototype was a four-door sedan - and made serious waves on the GM stand at the show. Before long, Harley Earl - General Motors' styling guru - mooted the possibility of it going into production. In '57, the Eldorado Brougham roadster was duly released. The Brougham's brand of elegance went beyond its exterior. The interior accessories list was a long one - its items more associated with fashion than automobiles! Female passengers were particularly pampered. There were polarised sun visors, magnetised tumblers in the glove box, and cigarette and tissue dispensers. There were lipstick and cologne, a compact and powder puff, and a mirror and comb. There was even an Arpege atomiser - with Lanvin perfume. Carpeting was in karakul, or lambskin. Hey, any lady who complained about that little lot was probably getting out at the next set of lights! But the Brougham's litany of luxuries did not stop there. It was only right that masculine tastes were catered to, too. How about a 6.3-litre V-8, for starters? Serving up 325bhp, it was mated to GM's Hydramatic transmission. And all supported by an X-frame chassis, and air-assisted suspension. The Brougham's cockpit was fitted with power brakes and steering - plus, electrically-operated seats and windows. Virtually the whole cabin was wired up, one way or another. This was the 1950s, after all, and gadgets and gizmos were everywhere! The Brougham was an exercise, then, not just in styling, but in cutting edge science. One of the most exotic cars ever to have come out of Detroit, it was a skilfully contrived cocktail of restrained glamour. And the Eldorado Brougham could be whatever you wanted it to be. For, with 44 trim combinations on offer, your dream Caddy was a cinch! Thnx for the great article! My pleasure, Larry ... so pleased you enjoyed it!